Public discourse in the United States on the Indo-U.S. nuclear agreement was limited, in sharp contrast to the vibrant debate that took place in India. The fact that a deal to bring India into the nuclear mainstream appeared repeatedly in various forms between 1998 and 2005 is often overlooked. Given the structural, long-term objectives of both states, an arrangement on India's nuclear status would have had to have been considered eventually, but the terms of a deal may never have proven as favourable to India as they did in July 2005. A nuclear halfway house for India could not have been seriously contemplated prior to India's nuclear tests of May 1998. The French government proposed a nuclear exception for India in late 1998, which was at the time rejected by the Clinton administration. Beginning in late 2001 under the presidency of George W. Bush, a flexibility on international norms, the view of India as a potential balancer to a rising China, and a growing appreciation for India's liberal democracy led to a willingness on the part of the United States to consider a nuclear exception. This attitude extended to only a few key individuals in the U.S. administration. Prime Minister Vajpayee raised the possibility of civil nuclear collaboration in November 2001, and national security advisor Brajesh Mishra discussed this issue with Secretary of State Colin Powell in July 2002 and at a speech in May 2003. By September, the outline of a "glide path" was established, an arrangement that was to become the Next Steps in Strategic Partnership (NSSP). Powell publicly spoke about the Indian insistence on civil nuclear cooperation in October 2003. The final stage of working towards a deal began under new administrations in both countries in November 2004, and Condoleezza Rice discussed the feasibility of amending U.S. laws with colleagues during her first week as Secretary of State. The environment in 2005 was much more conducive to a deal: India-Pakistan tensions were at a low, India and the United States had a number of dialogues in place, and the militaries were increasingly engaging one another. A nuclear agreement was discussed during Rice's visit to India in March, during External Affairs Minister Natwar Singh's visit to the U.S. in April, and during Bush and Manmohan Singh's meeting in Moscow in May. In May and June the Bush administration held interagency meetings on the issue. Meanwhile, the non-proliferation voice in the U.S. government was sidelined. The announcement of the deal was followed by significant bureaucratic opposition in the U.S. government, as well as criticism from the non-proliferation lobby. The American press corps did not immediately seize upon the significance of the deal. Many steps were still necessary to enact the agreement, the first of which involved negotiating a separation plan for India's nuclear infrastructure, for which a compromise proved necessary. The non-proliferation arguments against the deal were several: India would receive a pass for its previous bad behavior, India might bolster its nuclear arsenal by diverting indigenous fuel towards its weapons programme, and an exception for India might set a bad precedent for other nuclear aspirants. 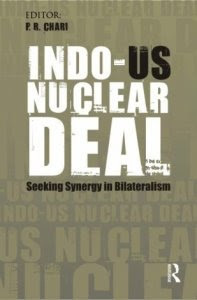 In defense of the deal, American proponents emphasised the strategic gains of a partnership with India, commercial advantages for U.S. corporations, and the non-proliferation benefits of India's de facto inclusion within the nuclear regime. Several compromise positions were also suggested. Various forms of opposition to the deal emerged from the U.S. government bureaucracy and from Congressional staff. Regardless of the rationale behind them, India's votes against Iran at the IAEA were significant in countering opposition to the deal. The American press and media commentators were by and large opposed to the deal, despite its backing by strategic experts, business groups and the Indian-American community. Congress introduced bills to enable the deal in May 2006, although hearings on the subject began in October 2005. The qualified support of leading Democratic lawmakers such as Joe Biden and John Kerry, following Rice's testimony in April 2006 played favourably in the U.S. media. Behind the scenes there was greater opposition, but the votes in favour of the legislation - or the Hyde Act, as it became known - were overwhelming, as it progressed through each stage. Significant lobbying by the State Department during the conference stage in early December 2006 prevented the inclusion of several last-minute "deal-breakers." While the influence of the Indian-American community is widely credited for the passage of the Hyde Act, the voting patterns do not reveal a direct influence. Rather, the role of business lobbies and India's appeal as a partner seemed to hold greater sway over lawmakers. From an Indian standpoint, the final legislation was hardly ideal, as it included language related to non-proliferation, limited cooperation on sensitive technologies and did not adequately assure fuel supplies to India. Language pertaining to India's relations with Iran was also deemed detrimental. Several of the apparent limitations imposed by the Hyde Act were reversed by the bilateral 123 Agreement, without directly violating U.S. law, through the establishment a special reprocessing facility under safeguards, and U.S. assistance in developing a fuel supply bank for India. While negotiations for the 123 Agreement were underway, both the United States and India began lobbying Nuclear Suppliers Group (NSG) member countries. Although the Agreement countered opposition to the deal in India, its terms incited further dissent in Washington. With the negotiation of the 123 Agreement, the main obstacles to the deal's realisation in Washington had been overcome. Following the Indian agreement with the IAEA over safeguards and the confidence vote in the Indian parliament in July 2008, unanimous NSG approval was required. In late July 2008, Bush, Rice, NSA Stephen Hadley and other senior officials held a meeting in which they agreed to "pull out all the stops" to get the deal through. By early August, it was concluded that two plenary NSG meetings would be required to get "the cleanest possible exemption for India." Rice made a case for India's exception during a visit to New Zealand, and the Americans also coordinated with Moscow. State Department officials also met with House Foreign Affairs Committee Chairman Howard Berman, who remained sceptical of the deal. The NSG waiver was eventually made possible with the help of significant U.S. lobbying. Final Congressional approval was granted at short notice in early October, with the necessary legislation only barely passing the full House of Representatives. Bush's signing statement, which provided assurances of adhering to the 123 Agreement - including on fuel assurances and advance consent to reprocessing - satisfied lingering Indian concerns. The deal was formally signed by Rice and Pranab Mukherjee on October 10, 2008. Several structural imperatives led to the deal's enactment despite numerous obstacles. These included calculations pertaining to the Asian balance of power, India's energy and technology demands, American desires to access the Indian market, and U.S. concerns about India's presence outside the nuclear regime. The belief that no other American government could have contemplated such an agreement is questionable, although it is unlikely that another deal would have appeared in the same form.